Each week GeekTonic covers the TV scene with a complete listing of premieres, finales and specials for the week. This would be week two of the biggest finales. Lost, 24, Chuck and More. 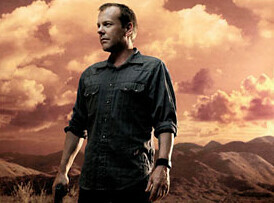 This week is the final episode of 24. What happens to Jack? The IFC Media Project (8pm on IFC – Available in HD) – Season 3 of the Independent Film Channel’s docu-series that gives an inside look at how news gets made. FlashForward (8pm on ABC – Available in HD) – This is the series finale since they cancelled it prematurely. I’m many episodes behind so I’m torn between watching them all or just deleting the lot and moving on. 100 Questions (8:30pm on NBC – Available in HD) A new “ensemble” comedy project spotlighting the life of Charlotte Payne living in NYC looking for love. The OCD Project (10pm on VH1) – Another realityTV show. This one has 6 patients with obsessive-compulsive disorder arriving at a treatment center. Hmm. The Tyra Banks Show (5pm Syndicated) – The end of Tyra Banks talk show. Ask the Readers - Which OS For Your HTPC?